In 2014 the WPT launched the Parrot Hero campaign to raise funds to help address the most urgent issues facing parrots. The campaign was a huge success and exceeded its goal in less than 90 days. The World Parrot Trust (WPT) is a unique wildlife charity devoted exclusively to protecting parrots, one of the most threatened groups of birds on earth. Partnering with leading parrot biologists and welfare experts, WPT provides effective solutions to help endangered parrots to survive in the wild, and companion parrots to thrive in captivity. WPT also works with local and international NGOs, scientific institutions, local communities, individuals and governments around the globe. It represents the most comprehensive effort of its kind, aiding 67 species in 42 countries, since 1989. Stopping the Wildlife Trade - WPT has helped put into place the EU trade ban, collaborated on bans in Indonesia and Mexico, and encouraged enforcement of local wildlife laws. It has also provided support for the confiscation, rehabilitation and release well over 5000 birds in Africa, Central America, South America and Indonesia. Conservation and Research - WPT is supporting scientific and field research which gain insights into parrot ecology and increase knowledge of lesser-known species. The Trust is also sponsoring captive breeding and release, participating in genetic studies, and using emerging technologies. Education and Awareness - Regional representatives for WPT have led and participated in local school and community awareness, seminars and conferences worldwide, global campaigns, and zoo exhibits/kiosks. The Trust also maintains websites and podcasts and a comprehensive online encyclopedia of parrots. Focus of future work: WPT continues to deal with new and challenging issues affecting parrots worldwide by using direct, hands-on conservation, research and advocacy actions. 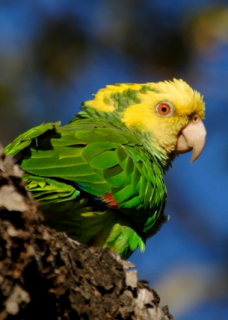 The Trust also encourages new ideas and dialogue in the fight to save parrots.